LOS ANGELES (Jan. 14, 2017) - The 2017 M.L.S. SuperDraft first round certainly fulfilled its promise to deliver fans with excitement, surprises and jockeying ahead of the 2017-2018 season ahead. 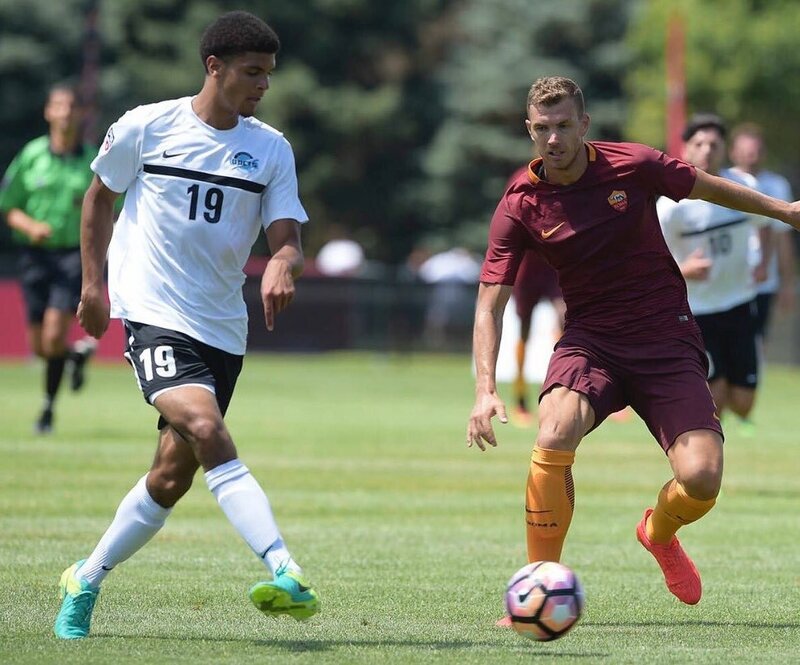 The first big surprise came at pick number three, when NYCFC traded $250,000 in allocation money in exchange for the Chicago Fire's third overall pick, selecting former Akron and current U-20 U.S. Men's National Team forward Jonathan Lewis. As if that wasn't enough to shake up the opening round's high profile prospects, Portland was on the clock next after trading up six spots with the Houston Dynamo to land former Duke and current U-20 MNT forward Jeremy Ebobisse. The one constant which was not a surprise, however, was the number of drafted players with U.S. Soccer Development Academy and Youth National Team ties. Out of the 22 picks in the first round, 14 are connected to the U.S. Soccer player development pathway. Player Development Pathway: Robinson was a member of the Development Academy's FC Boston Bolts from 2011 to 2015, playing in the U-15/16 and 17/18 age divisions. From his Youth National Team player pool, Robinson spent time with the U-18 MNT in 2013 and has since been a frequent call up to the U-20 MNT. Player Development Pathway: During the 2015-2016 Development Academy season, Lewis had a break out season for Kendall SC out of Miami Fla. Since then, Lewis has been a consistent call up for Tab Ramos' U-20 MNT. Player Development Pathway: Since a U-14 Boys' National Development Program ID Camp in 2010, Ebobisse's name has continued to emerge atop the 1997 birth year player pool. After playing for the U-18 squad in 2013, Ebobisse has consistently seen his name on U-20 roster announcements. During the 2013-2014 Development Academy season, Ebobisse was a standout performer for Bethesda-Olney's U-17/18 Academy Club. He was named East Conference Player of the Year in the Development Academy that season. Player Development Pathway: Since playing for the Minnesota Thunder Academy for during the 2012-2013 season, contributing to both the U-15/16 and U-17/18 age groups, Yueill saw time with the Youth National Team's U-18 group in 2015 and has since been a staple player for the U-20 MNT. Player Development Pathway: Nerwinski played three seasons in the Development Academy from 2010-2013, all with the New Jersey Cedar Stars Academy. Player Development Pathway: Johnson played in the Development Academy for one season, in 2012-2013, for Georgia United's U-17/18 Academy Club. Player Development Pathway: Odoi-Atsem spent significant minutes playing with U-20 MNT in 2014. Player Development Pathway: From 2009 to 2012, Dunk played in the Development Academy for Dallas, Texas powerhouse Solar Chelsea, including a call up to the U-17/18 Academy Club during the 2010-2011 season where he started the season playing in the U-15/16 age group. Player Development Pathway: Storm spent the fall of 2010 and spring of 2011 training at IMG Academy in Bradenton, Fla. as a member of the U-17 U.S. Soccer Residency program. Player Development Pathway: In the Development Academy, Hamilton spent the 2011-2012 and 2012-2013 seasons with the Colorado Rush U-15/16 and U-17/18 Academy Clubs. Player Development Pathway: From 2011-2013, Hayes played for the Baltimore Bays Chelsea Development Academy Club. After getting attention for his play in the Development Academy, Hayes had multiple call ups with the U-18 and U-20 U.S. Men's National Team in 2013 and 2014. Player Development Pathway: Before spending three seasons training at the Development Academy's Real Colorado from 2010-2013, DePuy also played for the Irvine based Academy program, Strikers FC for the 2009-2010 season. Player Development Pathway: Aubrey developed for four seasons in the Development Academy, all with the Dallas Texans U-15/16 and U-17/18 teams. Player Development Pathway: Nana-Sinkam played two seasons for Development Academy program PA Classics from 2011-2013.